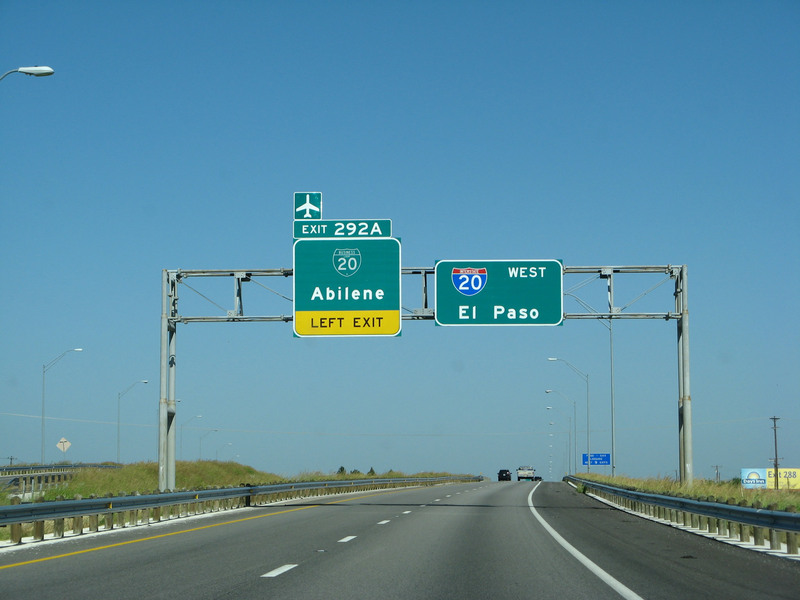 Westbound Interstate 20 approaches Exit 292A for Business Loop I-20 west into Abilene. This instance of Business Loop I-20 follows Old U.S. Highway 80. Photo taken 06/14/08. Interstate 20 has several business loops in the Lone Star State, plus a business spur in South Carolina. The loops in Texas are assigned an internal lettered suffix by TxDOT. Mileage and establishment dates for the Texas business routes were obtained from the TxDOT Texas Highway Designation Files. 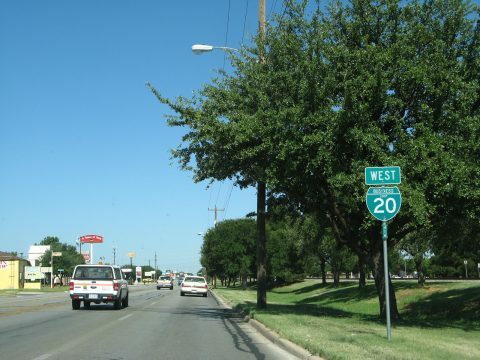 Business Loop I-20B runs from Interstate 20 west of Pecos (Exit 37) northeastward along old U.S. 80 through the city of Pecos along 3rd Street. The route emerges from Pecos across an agricultural stretch preceding the city of Barstow. Business Loop I-20 concludes at a wye interchange (Exit 52), 3.6 miles east of the city line. Established in 1991, the business route totals 14.04 miles. Business Loop I-20D runs 8.22 miles from Exit 76 through Thorntonville and Monahans along old U.S. 80 (Sealy Avenue) to Exit 83 in Ward County. Most of the Interstate 20 business loops in Texas were commissioned in around 1990 or 1991, about the same time that U.S. 80 was decommissioned west of Dallas. Business Loop I-20E branches north from Interstate 20 at Exit 112 into Odessa. Following 2nd Street and old U.S. 80, the business route continues to Midland International Airport (MAF) and Wall Street into the city of Midland. Front Street carries the route along the southern periphery of Downtown Odessa to an exit of the city. The loop concludes at Exit 144.
Business Loop I-20E was established on August 28, 1991 with mileage (31.76) transferred from U.S. 80. 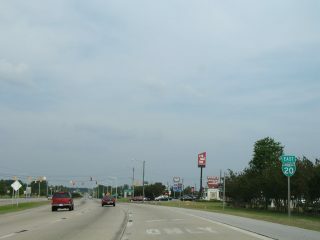 Traveling 4.69 miles, Business Loop I-20F follows old U.S. 80 (Front Street) through the city of Stanton in Martin County. It was commissioned on March 30, 1995. The Big Spring business loop follows old U.S. 80 between Exits 174 and 179 through the city of Big Spring. This includes a one-way couplet of Third Street and Fourth Street through Downtown. Business Loop I-20G replaced Texas Loop 402 for a distance of 5.61 miles on June 21, 1990.
Business Loop I-20H travels just 1.06 miles between Exits 206 and 207 at the city of Westbrook through Mitchell County. 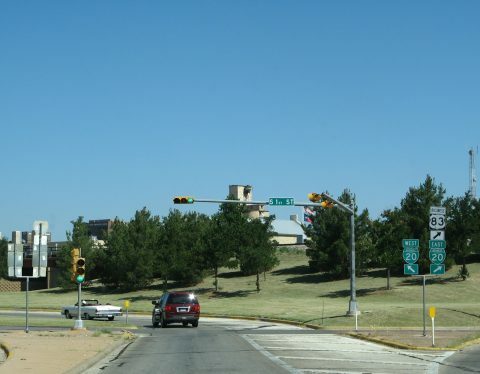 The route follows old U.S. 80, but its mileage was transferred from State Loop 333 in 1990.
Business Loop I-20J is 5.93 miles long, following old U.S. 80 (Second Street and Westpoint Avenue) through the city of Colorado City. The Mitchell County business loop replaced Texas Loop 377 in 1990. Running 1.63 miles, Business Loop I-20K follows old U.S. 80 between Exits 224 and 226B of I-20 through Loraine in Mitchell County. This route was established in 1990 in place of Texas Loop 316.
Business Spur I-20L spurs 1.64 miles northeast from Interstate 20 (Exit 235) along Broadway Street (old U.S. 80) to Business U.S. 84J (Cypress Street) in the city of Roscoe. U.S. 84 Business takes over Broadway Street from the spur end east to the U.S. 84 expressway ahead of its merge with IH 20. 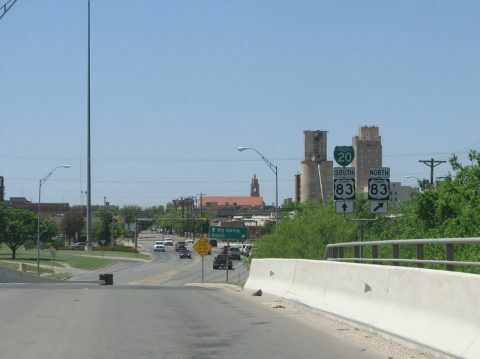 A 6.45-mile route, Business Loop I-20M lines Broadway Street (old U.S. 80) through the city of Sweetwater in Nolan County. The route ends at Exit 241 to the west and Exit 247 to the east. Business Loop I-20M was created in 1990 during a mileage transfer from State Loop 432.
Business Loop I-20N runs 2.07 miles in Taylor County via old U.S. 80. Beginning at Exit 261, the loop travels along First Street through the town of Trent to Exit 263. 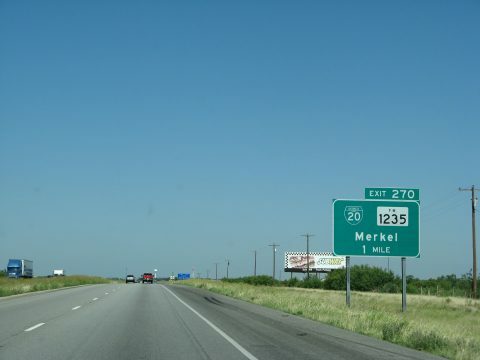 It replaced Texas Loop 319 when it was created in 1990.
Business Loop I-20P follows First Street through Merkel while IH 20 & U.S. 84 bypass the city to the north. The route begins at a split diamond interchange (Exit 267) west of Trent and concludes east of the town limits at a split diamond interchange (Exit 270) with FM 1235. The 2.79 mile route replaced State Loop 39 in 1990.
Business Loop I-20Q runs 1.66 miles through the city of Tye in Taylor County. Overlaying old U.S. 80, the parallels IH 20 along North Street from a point just west of Exit 277 to the Sparks Road on-ramps. Exit 277 connects the freeway with the business route via Scott Street. Business Loop I-20R splits with Interstate 20 along side U.S. 84 from Exit 279 east to U.S. 83 and U.S. 277 (Winters Freeway) on the west side of Abilene. The route totals 12.4 miles overall; 8.47 miles separate from U.S. 84 along First Street and Old Highway 80 through Abilene to Exit 292A. Business Loop I-20R replaced Texas Loop 355 in 1990.
Business Loop I-20T runs 2.83 miles through the city of Baird in Callahan County via old U.S. 80. 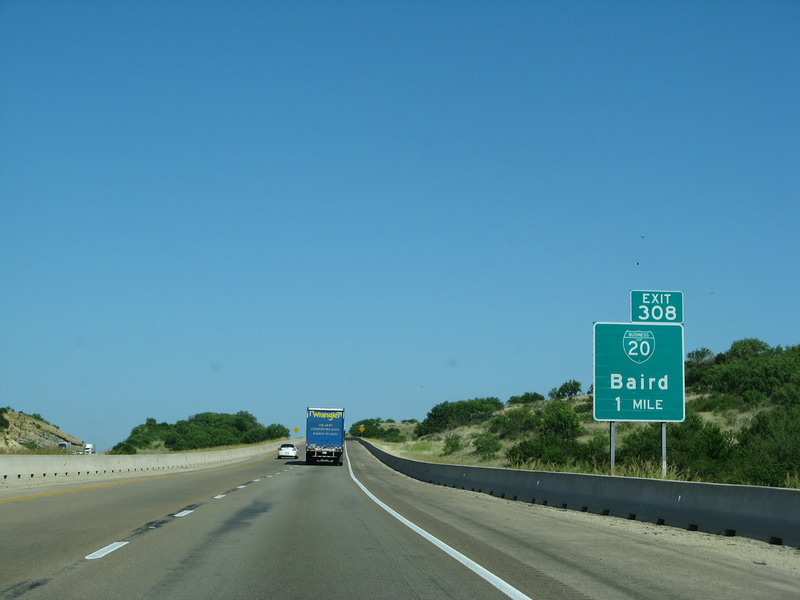 Created in 1990 with a mileage transfer from Texas Loop 425, the loop ties into Interstate 20 at Exit 306 to the west and Exit 308 to the east. Business Spur I-20 extends 2.11 miles east from the exchange of Interstates 20 and 95 into the city of Florence. The commercial arterial (David McLeod Boulevard) serves an array of traveler services and retail, including Magnolia Mall, to U.S. 76 (Palmetto Street) by Florence Mall. 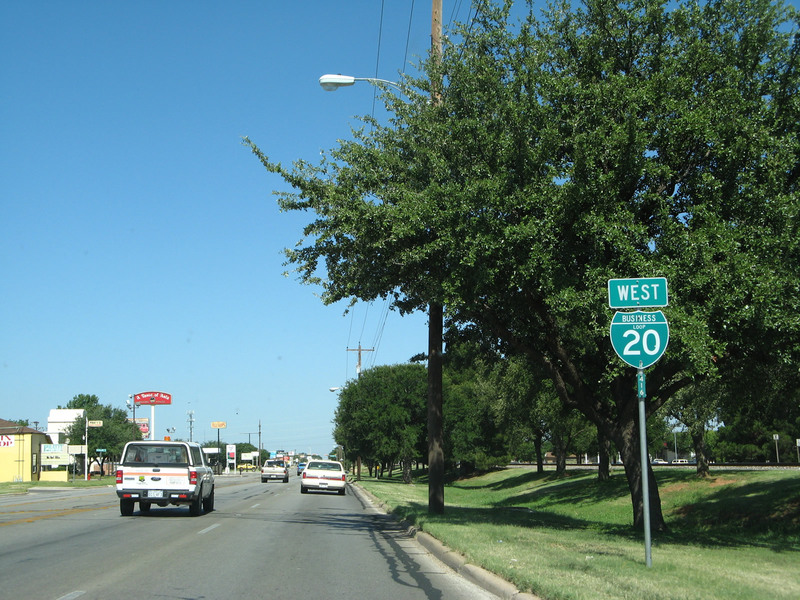 Exit 226B departs IH 20 west for Business Loop I-20K (Pacific Avenue) west into Loraine. This loop follows former LP 316 to Exit 224. Photo taken 06/14/08. Business Loop I-20R west crosses the Martin Luther King, Jr. Bridge in Abilene, Texas. Photo taken 04/18/08. 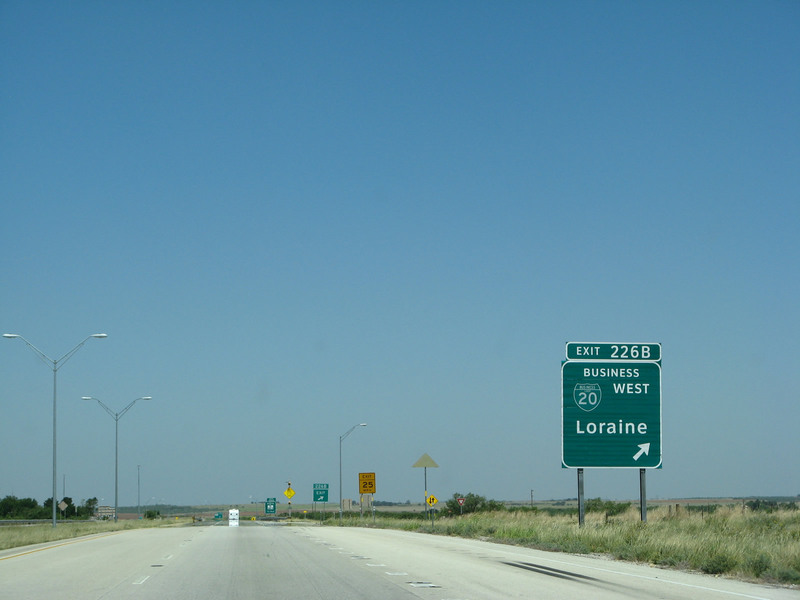 The Texas business loops for Interstate 20 lie west of Fort Worth and represent old alignments of U.S. 80; each is assigned a letter to differentiate the various business loops from one another. The loop&apos;s letter designations generally increase alphabetically from west to east. Reassurance marker posted along 1st Street west of Sayles Boulevard near Downtown Abilene. 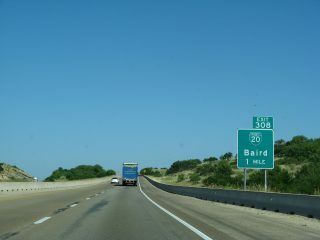 Occasionally the TxDOT internal suffixes for business routes appear in the field, such as the letter R on this assembly. Photo taken 06/14/08. Northbound U.S. 83 Business (Treadaway Boulevard) at Business Loop I-20 in Abilene. The two briefly overlap between South 1st Street and Highway 80 at North 1st Street. Photo taken 06/14/08. 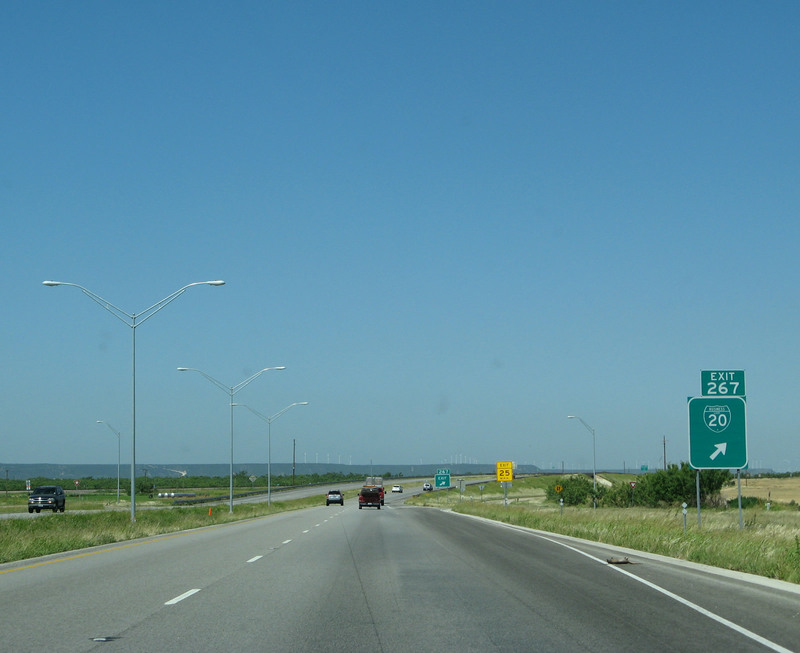 Westbound Interstate 20 approaches Exit 308 for Business Loop I-20 to the Callahan County seat. Photo taken 06/14/08. Business Spur I-20 stems east from the freeway end of I-20 to U.S. 76 in Florence. Photo taken 05/28/07. Business Spur I-20 is one of five Interstate Business Spurs in South Carolina. SCDOT uses spurs and connectors for U.S. and State Highways as well. The other Interstate spurs included unsigned ones for I-385 and I-585, a partially signed one for I-126 and a well posted one for I-526. Business loops signed from Interstate 20 in Texas have both ends signed from the mainline. This example shows Business Loop I-20P in Merkel. Exit 270 is the eastern end of the loop, and Exit 267 is the western end of the loop. 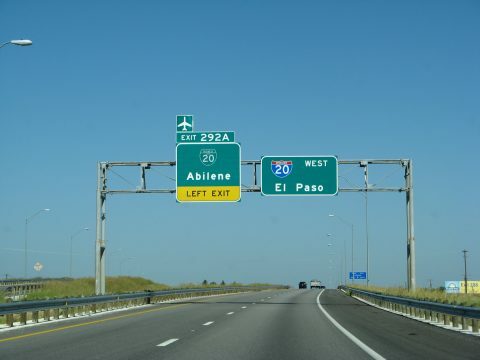 While Arizona and Idaho generally follow the Texas approach to signing business loops at both ends, other states such as Wyoming, Montana and South Dakota only sign the first interchange with Business Loop shields. Photos taken 06/14/08.